And we’re back with another dish I learned to make while in Thailand! 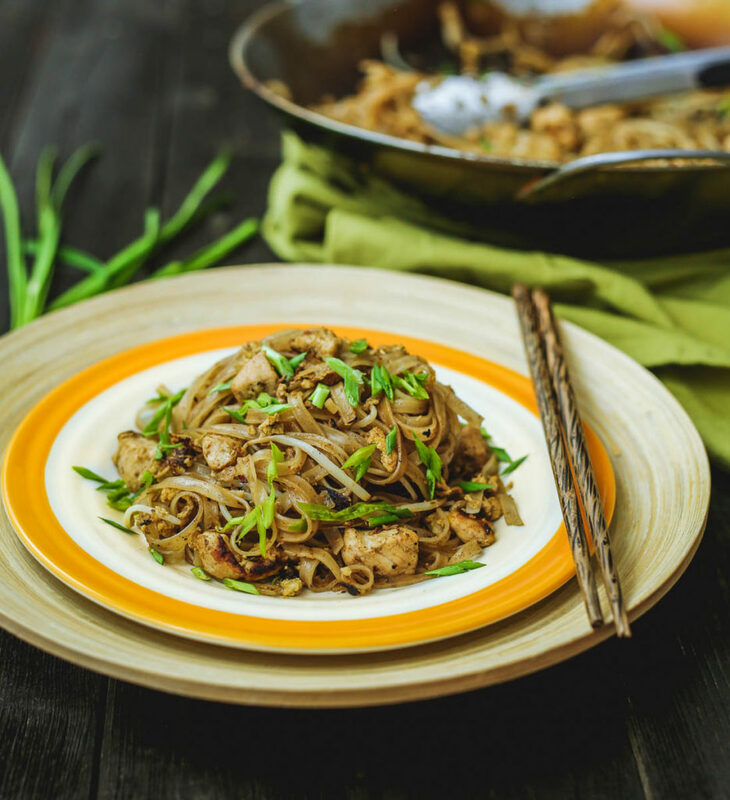 I never before tried to make any of the recipes I learned in Thailand except for one: Pad Thai. 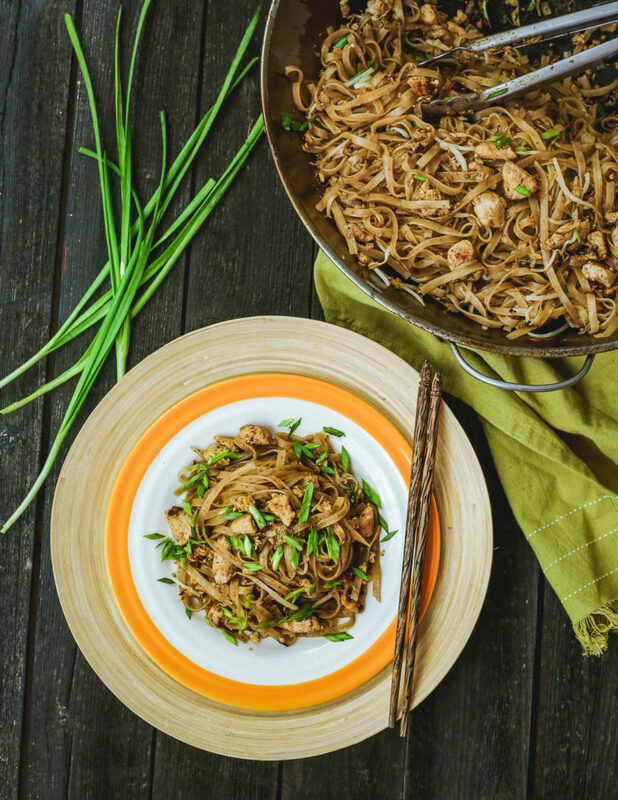 I feel like pad Thai is a staple in many restaurants, even those not claiming to be Thai cuisine. I remember the first time I attempted to make pad Thai. It was quite a while ago actually, and I could not find kosher fish sauce — the key ingredient — anywhere, so I searched instead for a vegan recipe. What came out was a really delicious noodle dish. To me, this was Pad Thai. How was I to know any better? 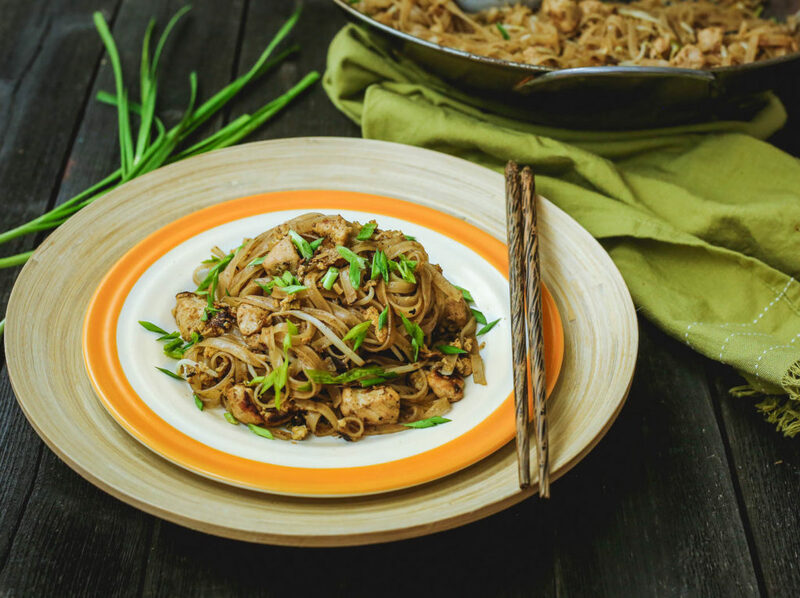 A couple of years later, a kosher fish sauce came out on the market in the US and I was so excited to cook and taste an authentic Pad Thai. One problem: I immediately started gagging the moment I opened the bottle of fish sauce! The smell was beyond terrible. I sucked it up anyways and assumed it would taste better then it smelled, as so many people are obsessed with it, so it had to be good, right? Wrong. That was definitely not the case. The taste was just as bad as the smell. I could barely manage one bite and my husband wouldn’t even try it; we threw the rest out. Now, some people like this brand of fish sauce, so it just must have not been my taste. It was too overwhelming for someone who not used to this flavor palette (and I only used a tsp, by the way). So I settled on my old pad Thai recipe and made it often, since we really enjoyed it. You can find that recipe here. When I moved to Israel I actually found kosher fish sauce readily available, but I had been so traumatized by my last experience with it that I didn’t even attempt to experiment. Fast forward to my trip to Thailand and one of the key ingredients that the cooking school told me in advance to bring was, of course, fish sauce. I decided to brave it out and bought a bottle in Israel recommended to me by the local store owner to see how it would go. Our cooking class finally arrived and our first dish to learn was Pad Thai. I was so nervous and excited at the same time because I have been dreaming of an authentic Pad Thai for so long but I was worried that maybe the authentic flavors were just not to my taste. I was so wrong about that, and I guess the version I tried in New York was just not that great. The dish came out amazing but also sooooo far away from what I had been calling ‘Pad Thai’ until now. While that old dish is great and delicious it tasted nothing like what an authentic pad Thai tastes like. The fish sauce adds so many layers of flavors that cannot be achieved without using it. Also, the tamarind paste itself brought this sour taste that couldn’t be achieved just by adding limes or lemons. Of course, not everyone can find kosher fish sauce (or even tamarind paste), so if you can’t find these ingredients, definitely use my old recipe as it looks pretty similar and until you taste the real thing you won’t know what you’re missing anyway! Also, if you cannot find a fish sauce that can be used with chicken (kosher-wise), substitute the chicken for tofu, seitan, tempeh, or whatever vegan substitute you usually reach for. Don’t substitute the fish sauce; there is no good substitute. Palm sugar is another really nice addition to this authentic recipe; it is a lot smoother than regular sugar. It should be readily available but if not substitute equal amounts of brown sugar. I actually made it in Thailand with brown sugar as I didn’t bring kosher palm sugar with me, and then made it with palm sugar back home. They both work! Soak the rice noodles in warm water until al dente. We don't want them to be perfectly cooked as they are going to continue to cook and soften in the final mixture. Heat up 1 tbsp grapeseed oil in a large wok over a medium flame. Fry the shallots and garlic, until fragrant. Add the chicken pieces and keep stirring until the chicken is cooked through. Crack the eggs into a cup and whisk with a fork. Add into the wok and stir until they are cooked. Push everything to the side of the wok and add in the rice noodles, adding a little bit of water to allow the noodles to keep cooking for 5-7 minutes. Whisk together the fish sauce, mushroom sauce, tamarind, sriracha and palm sugar and mix into the noodles. Stir everything thoroughly combined. Add the bean sprouts and garlic chives, stir quickly to mix and then remove from the heat. Serve with lime halves, peanuts and crushed red pepper flakes.